Alex Rueb was born and raised in Omaha, NE. Having a strong interest in music from an early age, Alex started playing piano at age 10 and moved on to guitar at 13. At age 17, he picked up a cheap mandolin from a pawn shop and was quickly hooked, marking the start of his addiction to bluegrass music. Alex moved to the Austin area in 2002 to check out the music scene and soon joined The Grassy Knoll Boys where he honed his mandolin chops and developed a love for singing three-part harmonies. 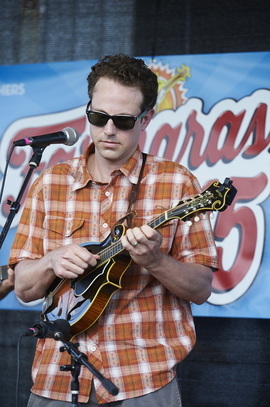 When Alex stumbled upon the The Lost Pines in 2010 he was immediately impressed with the band’s original songwriting and deliberate arrangements – a rarity in the Austin bluegrass scene. He was thrilled when he received an invitation to contribute to the band’s upcoming record with producer Lloyd Maines and became a full-time member of the band shortly thereafter. Aside from bluegrass music, Alex enjoys playing jazz piano, latin, and gypsy swing.